This year marks the 100th anniversary of the Annual Exhibition at the Maier Museum of Art, arguably the longest continuous (but for one year during World War I) annual exhibition devoted to American art in the United States. Historical assessments of past Annual Exhibitions show scant detailed documentation. However, checklists of the works included do exist and reveal that the American (and sometimes European) artists represented were among the major figures in contemporary art movements of the period. To understand and appreciate fully the significance of one hundred years of exhibiting the best of American art, one must consider the circumstances that put such a plan into action. The story begins with an institution, Randolph-Macon Woman’s College, and its vision for higher education and the arts in this country. 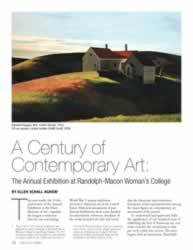 It is also a story of individuals who singularly and collectively “never took their hands from the plow” in their determination to use the Annual Exhibition as a catalyst to establish and build a permanent collection of art at Randolph-Macon Woman’s College. After graduating from Randolph-Macon Woman’s College with a B.A. in art history, Ellen Schall Agnew continued her studies at Binghamton University, where she received an M.A. in art history, specializing in American art and museum studies. She began her career at the Chrysler Museum of Art in Norfolk, Virginia, and then returned to Lynchburg to work at the Maier Museum of Art at R-MWC. She spent twenty-three years at the Maier, from 1984 to 2007, serving full-time as curator and director, and then part-time as associate director. The author’s involvement with statewide arts organizations has included serving on the executive council and as the director-at-large for the Virginia Association of Museums, on the advisory panel of the Virginia Commission of the Arts, and as a juror for the Visual Arts Fellowship Program at the Virginia Museum of Fine Arts. Locally, she has served on the board of managers and collections committee of Point of Honor. She is currently serving on the Lynchburg City Schools special education advisory committee, Riverviews Artspace board of directors, and Mercy Care Centre Foundation board. She is also an adviser to the Friends of the E.C. Glass Art Collection.